*The events portrayed in this mini-game are products of my dreams. Any resemblance to elements of the core game, including characters, names, capabilities, and locales, is purely coincidental. Notte is calling the shots! Sweet Sassy Molassy everyone, Notte here, have you checked into the world of Dragalia Lost lately? If not, you really should! The head honchos over at Cygames and Nintendo have decided to give me my own role in this standalone shoot-em-up! Does a little ole Faerie like me have the strength to win against all these tough opponents? Well, you’ll just have to keep reading as I debut in my role as the star in this mini adventure. Cygames are no strangers when it comes April Fool’s Day gags and adding mini-games to the projects. With Granblue Fantasy, every year players can undertake an in-game boss fight featuring the game’s mascot. As for Notte’s Slumber Shot, this is a one day event where I, Notte, become the hero of my own story and the RPG gameplay of Dragalia Lost’s is replaced with gameplay more befitting a shmup. It isn’t that grand, but it’s a good first step for the years to come with Dragalia Lost just having reached its 6 month anniversary. Upon starting the mini-game you are given the option to select a difficulty level, which are Sweet, Sassy, or Molassy. (How fitting for a Faerie such as myself, right?) The challenge becomes more action-packed and out of control on whatever difficulty I may tend to embark on. I’d start you off with Sweet mode though, since you don’t wanna work poor Notte too hard, too soon! Once you begin, you start out with a shot level of 1 and it is your goal to continuously shoot (by holding down your finger on the screen) water drops at the oncoming enemies and golden Fafnirs. These enemies will drop sparkling stars, with some even dropping berries that will upgrade my water drops, hence increasing my shot level and power. Be sure to keep an eye out on the background while playing, since doing so will allow you to spot some familiar locations and some familiar guests! Make it far enough in the level and I may just encounter a giant familiar beast awaiting for me to beat it down! Earning high scores can be such hard work for a small Faerie of my caliber, especially when you approach the other difficulties! I won’t spoil too much for you, but expect a special surprise appearance upon reaching the end of the Malassy difficulty! In each difficulty, you can find a preset of high scores and once you hit those, the list will update with what you’ve achieved. Do I have what it takes to achieve my dream of a high score, or will my wings get tired whilst trying? What’s more, is that Notte’s Slumber Shot features the same graphics as the main game, alongside the usual catchy tunes coming from the game’s soundtrack. Even I have to agree that my style is quite lovely! Whew…. that was a lot for me to take in and write about for you all today. Notte’s Slumber Shot is an excellent and charming adventure starring yours truly! Although the premise may be simple at first, the game quickly ensures vast amounts of chaos upon reaching later difficulty levels. Do I have what it takes to achieve victory? Yes I do! 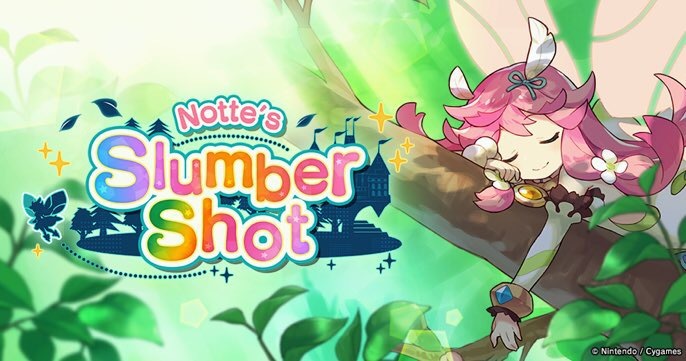 Although I am one tired Faerie, don’t dilly dally as this special adventure: Notte’s Slumber Shot is around just for one day only! Hopefully, the head honchos see this post and decide to make this mini adventure a yearly occurrence, or even a full game. Ah, that would be the dream.